I’m Right, I’m Wrong … all the time | DragonFire Inc. I was on vacation with my whole family in Hawaii. I heard my grandson (6) arguing with his dad out on the balcony. To me, the interesting part of this conversation was that they were both right, and Lauren was just the right height to see both perspectives. Depending on someone else’s point of view – they can see something entirely different than what you see. A few weeks ago, I was having a conversation with a friend of mine (Carsten Feilberg) in Denmark. 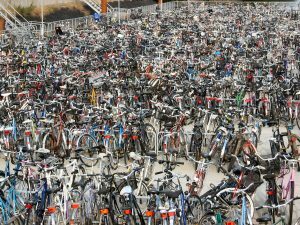 One of my comments to him when we were driving back from lunch, was that I couldn’t understand how anyone could find their bicycle at the train stations since there were so many. I noticed there were different colours, some people had decorated their own baskets, but … really, they were mostly all the same. He explained to me that they really are different – perhaps some have a specific sticker or seat, but mostly you just knew your own bike – because it was sized for you. I had to put it into my own context – something I was familiar with before I really got it. I thought of rows and rows of skis at the ski hill – how did I know mine. Part of it was the brand, and the size, but mostly I knew where I left them. During our drive, I also mentioned how pretty the spring green colours were on the trees. Carsten knew immediately what I meant although I don’t believe there is a colour called “spring green”. If I used that same phrase to someone from Singapore, they probably would have no idea what I meant, and I’d have to try to explain that concept – probably inadequately. Perspective is really about a person’s experience. What a person brings to a conversation, is a reflection of their unique perspective. Cross-functional teams bring different perspectives: business, programming, testing. Diversity on teams also brings different perspectives. I find that when I watch a high performing team in action, team members not only share ideas, but they listen and question their own perspectives so they get the best outcome for the team. I think it important to be able to understand other perspectives. And your granddaughter was able to bridge the gap. The car were not in the ocean, and they were not going to sink. It was a trick of the glass. One of the advantages of multiple perspectives is we can avoid the traps and illusions around everyday perceptions, it doesn’t mean everyone is right. Actually it usually means everyone is wrong to some extent. I agree. Truth is the basis of trust, so we do need to look at our own bias and be willing to admit our perspective may have been faulty. Brayden did learn something that day, but so did his dad. Hey Janet. Thanks for sharing this. Just a question: What would you say is the interplay between perspectives as described above and a team’s collective context (both in expanding it in teams, and in maintaining it)? I think the trick is to keep an open mind to try to understand the other person’s perspective – not always easy if you cannot share their experience.